Located at the base of Hatcher Mountain, this adorable honeymoon cabin is perfect for couples looking to visit Wears Valley and have easy access to their cabin. Accessible during snow events. First time ever on rental, Dancing With The Bears is a perfect choice for those who do not like traveling up scary mountain roads. Located at the base of Hatcher Mountain, traveling to and from the cabin is easy. 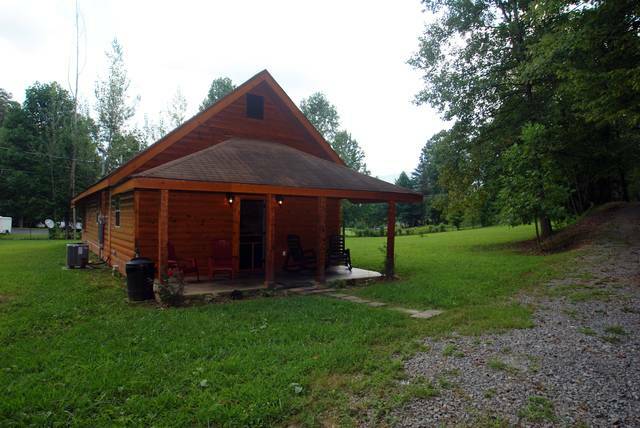 If you are coming to the mountains to relax, take in the views of the Smokies, and hike, this cabin is a perfect choice. As you enter the cabin, you are welcomed by the warmth of the comfortable furnishings in the living-room and the large kitchen - perfect for cooking a romantic dinner for two. Down the hallway, you will find the 1/2 bath, laundry room, and at the end of the hallway - the bedroom with its private bathroom. Indulge yourself in the jetted indoor tub. After a day of play in the mountains, relax in the hot tub - located on the screened-in back porch.